This is the third release in the Revival series, that celebrates the revival of whiskey distilling in Dublin. It is matured in ex-Bourbon barrels and then finished in Pineau des Charentes (a fortified wine made from grape must and Eau-de-vie) casks. White fruits, grape sweetness and light citrusy notes in the smell. Some pineapple and honey sweetness in the end. Actually kind of like a mix of Calvados and Brandy (or maybe I’m just getting confused here). Very sweet at first in the taste, and the grapes comes forward again. Some pineapple again, but here it mixes with some dried fruits. The finish is very sweet, accompanied by raisins and prunes. Some dried apricots as well. It is very different from classic Irish whiskey. Very special, and it took me a couple of sips, but I really enjoy it. 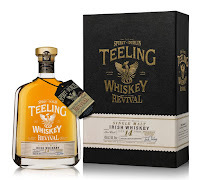 In general, I think that Teeling are pretty good at playing around with alternative casks. I will give this 83/100 (20/21/21/21).